Are "Dual Enrollment" Students Considered College Students on the FAFSA? Currently one son is a junior in a 4-year college. The next one is a high school senior and will attend the same 4-year college in the fall. Last, I have twins that are sophomores in high school. This fall the twins will have "dual enrollment." Our school district allows juniors and seniors to take one or two classes per semester at the local 2-year technical college. The courses will count for high school credit as well as college transfer credit. Can I count all four children on FAFSA as college students even though the twins will only be part time? — Lisa B. You cannot count the twins as college students on the FAFSA. Only children who will attend an eligible college or university on at least a half-time basis for the purpose of obtaining a degree or certificate are eligible for federal student aid and may be counted as part of the number in college on the FAFSA. Such students are referred to as regular students. Students who are enrolled in "dual enrollment" programs are not considered regular students because completion of the program does not lead to a degree or certificate and because the students are ineligible as they do not yet have a high school diploma or its equivalent. Likewise, students taking Advanced Placement (AP) classes or International Baccalaureate (IB) classes are not considered to be college students. Dual enrollment programs are discussed on page 1-5 of the 2010-11 Federal Student Aid Handbook, which states: "A student enrolled in elementary or secondary school is not eligible for aid from the FSA programs, even if she is simultaneously enrolled in an eligible college program. 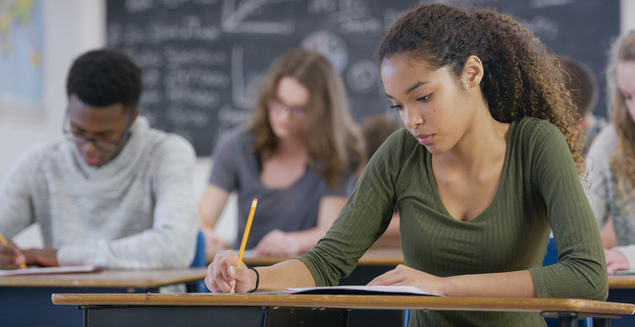 A student is considered to be enrolled in secondary school if she is pursuing a high school diploma or if she has completed the requirements for a diploma, has not yet received it, and either she is taking college coursework for which her high school gives credit or her high school still considers her to be enrolled there." The Federal Student Aid Handbook is published by the US Department of Education to provide guidance to college financial aid administrators in interpreting federal laws and regulations concerning federal student financial aid. The FAFSA requirements are based on sections 484(a)(1), 484(b)(3), 484(b)(4), 475(b)(3), 476(a)(2) and 477(a)(3) of the Higher Education Act of 1965 and the regulations at 34 CFR 600.2 "Regular Student" and 34 CFR 668.32(a)(1). For example, the following is an excerpt from section 475(b)(3) of the Higher Education Act of 1965, which discusses the calculation of the parent contribution part of the expected family contribution (EFC): "dividing the assessment resulting under paragraph (2) by the number of the family members, excluding the student’s parents, who are enrolled or accepted for enrollment, on at least a half-time basis, in a degree, certificate, or other program leading to a recognized educational credential at an institution of higher education that is an eligible institution in accordance with the provisions of section 487 during the award period for which assistance under this title is requested". This section of the Higher Education Act of 1965 clearly limits which family members are counted as college students in calculating the EFC. These restrictions remain in effect even though sections 101(a)(1) and 102(d)(1) of the Higher Education Opportunity Act of 2008 amended sections 101(b) and 102(b) and (c) of the Higher Education Act of 1965 to permit eligible institutions of higher education to dually enroll secondary students as regular students effective July 1, 2010. The amendments made by the Higher Education Opportunity Act of 2008 relate to the definition of an institution of higher education and not to student eligibility for federal student aid.